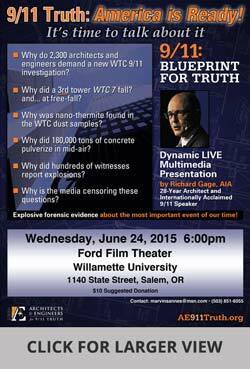 Attention AE911Truth supporters in Oregon! 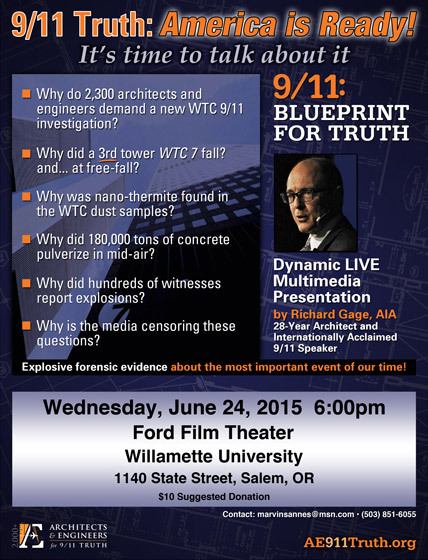 You are invited to join us for a dynamic multimedia presentation by Richard Gage, AIA, founder of Architects & Engineers for 9/11 Truth, in Salem, Oregon, this Wednesday, June 24, at 6:00 PM. Gage will be presenting the evidence for the explosive destruction of all three World Trade Center skyscrapers on 9/11. The 90-minute presentation will be followed by a Q&A discussion format. Please bring three people who you know that are new to this information.